I wasn’t expecting to love this product as much as I do. When looking for a moisturiser I usually go for super sensitive skin formulas with a crazy list of ingredients I cant even pronounce. Lately, I’ve found myself looking for minimal ingredients as this lowers the risk of reaction. For most people, this isn’t a major concern, but for me it’s the difference between itchy red skin and soothed clear skin. 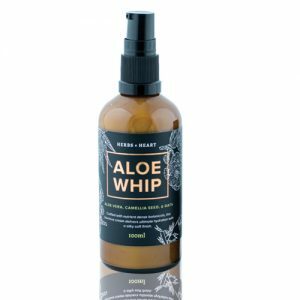 Aloe Whip has 3 ingredients. Aloe Vera: full of amazing healing properties. Soothes burns, itchy and irritated skin. Improves skin elasticity and even gives oxygen to the skin. Camellia (Tea) Oil: Fights free radicles and signs of aging. Packed with vitamins A, B, D and E as well as Omega 3, 6 and 9. It absorbs almost as fast as water due to the molecular weight matching that of the skin almost perfectly. Oats: Oatmeal is unbelievably soothing to irritated skin, especially sensitive and reactive. It helps to reduce inflammation and redness as well as providing a kind of second skin to protect from free radicals. The first time I applied this to my skin, it literally rehydrated the dry patches and they just fell off my face. I have only ever experienced that from and exfoliant, which is not ideal when your skin is so dry and itchy. I absolutely recommend this for everyone, but if you have sensitive skin, its perfect. I’m not a fan of scented products so this is great. T has a very subtle vanilla scent thanks to the oats. A 100ml pump bottle retails for $29.99 AUD. Visit www.herbsandheart.com for this and other amazing skincare products. Hi there, I'm Samantha - Located in Brisbane, and love to explore this wonderful city and it's events, shops, food and lifestyle. Read my about my Brisbane experiences, beauty & makeup products and living the Brisbane lifestyle.